I won't lie - I'm very interested to see how this Netanyahu speaking to Congress thing plays out. I don't really care what he has to say, as if you follow any of his politics, you know what his agenda might be, especially in regards to Iran and since Israel Primer Minister elections are to be held in the next fortnight. Regardless for my thoughts on the current state of Israeli politics, I'm just fascinated and flabbergasted at Bohner's invite and continued pursuance of this matter. Yes, the majority of Americans don't support his action in this matter - but such is true his approval rating with his constituents and the House (I'm still laughing at his need to reach out to Democrats for a temporary payment for the TSA, because he can't pass it with his own party). Of course, the major disliking of Boehner, his actions and inactions have never swayed him before. Mostly because he's a brainless douchebag. I am a little surprised at Netanyahu - or any leader - who would willingly circumnavigate the conventional process of another countries procedures this way. You'd almost have to believe he wouldn't stand for it should it happen in his homeland. But as I said, he has an agenda. But Boehner has a bigger one. He's been horribly unsuccessful at embarrassing or truly undermining the President, but by-gum he's a trooper, and he certainly keeps trying. He's like the Coyote and yet, Obama still seems to be the Roadrunner. Unfortunately, Boehner is using Capitol Hill as his own Acme Supply Co. Since that law suit he has against Obama has gone nowhere fast (other than billable hours to whichever law firm he hired), he has to try to get to Obama another way. Yet somehow when Obama allegedly goes against protocol, it's a law suit. When Boehner does it......well, I don't know what he's calling it....except justified....at least in his eyes. The manly thing for Bibi to do would be to reject Boehner - even at this late hour. It's not like he doesn't have a soapbox to stand on to make his point. Television cameras follow him around all the time, he can make his case and members of Congress can choose to watch his pontificating if they so choose. This partisanship has gotten way out of hand. Boehner certainly can't complain about Obama making his own rules (which he isn't), if he's going to do exactly what he protests against. Just StFU. 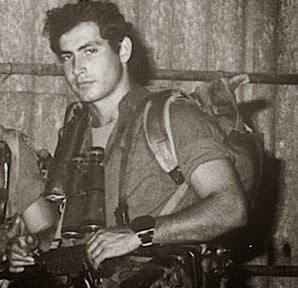 Netanyahu, though, as a soldier in the Israeli Defense Force, was a looker. Actually, in he kind of still is. Yes, I know that's off the subject, but my blog: my rules. He was hot then, he's a douche now. Yeah he was kind of a looker. If he had a beard in that photo, I know what blog it would show up on. I don't understand all the politics behind his visit, but I thought your writing was helpful. thanks .